The Courage to Try Something New | Re-Jeweled! Any new idea you can dream up and clearly define can become a reality! True, there will always be plenty of people who will try to discourage you – legions of small thinkers whose response will be “that’ll never work”. Don’t listen to them! These are the same types who insisted the world was flat and Columbus was a fool to try to sail “around” anything. They’re the same ones who were absolutely positive we’d never put a man on the moon. Listen to your heart and commit to trusting your own instincts. Don’t let anyone else determine what you should do or what you cannot do. Don’t give anyone that much power over your life and your chosen path. Every great invention, idea, concept, book, song, work of art, and even every business began with one person’s idea. Just the idea. Then it was developed by the person courageous enough to believe in it, nurture it, breathe life into it, and take every step necessary to bring it to fruition and make it real. Believe in your own idea and keep a running list of all the reasons why it WILL work. Ignore anyone who says it won’t. As Dr. Wayne Dyer said, “You’ll see it when you BELIEVE it”. Whether your life has suddenly been changed by death, divorce, domestic violence, disease, downsizing, OR... if you're re-inventing your life through discovery and desire, this book is for you! You can begin right now living a Dream-Based Life focused on your passions and priorities! Re-Jeweled will show you how to: capture the power of the sub-conscious; see yourself living your dreams; harness the secret of abundance mentality; visualize and affirm your way to success; make your expectations bring sparkle to your Life; take charge by setting boundaries; bring about what you talk about! 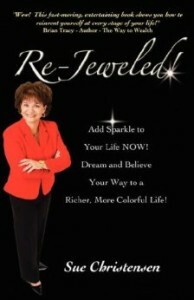 Author/Speaker Sue Christensen has had a history of achievement in business for over 30 years. She has made Life-Re-Invention an art form starring in her own production. © Copyright 2013 - Re-Jeweled!